One thick rope (like a tug-of-war rope). Mats for under the rope. Split the class in two and have them set up, lengthwise, in the playing area as though preparing to have a tug-of-war. Lay mats in between the two groups and have each group pick up their end of the rope. The students must hold the rope as though they were going to do a tug-of-war (i.e. the rope cannot be much higher than their waists and should never be more than approximately 3 feet from the ground). Select one person to be the monkey. It is this person’s job to hang onto the rope, above the mats, for as long as the class can hold them (remind them to be aware of their head). When the teacher says “Go,” the timer starts. Every 10 seconds, the last two people on either end of the rope must SLOWLY let go of the rope. When/if there are only 4 people left holding the rope (2 on each side), they can try and hold the monkey up for as long as possible). 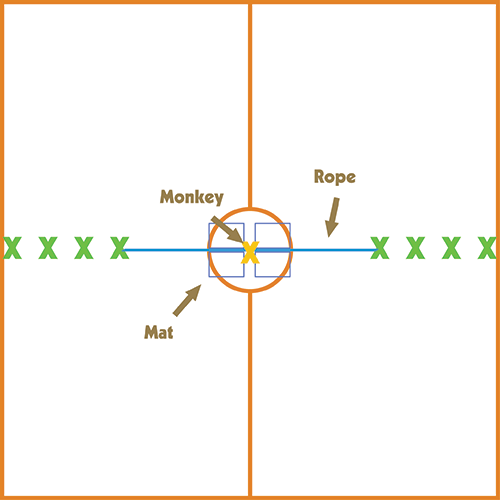 If ANY PART of the monkey’s body touches the mat at any time, then the challenge must be re-started with everyone back on the rope. Do the challenge as many times as you like, and then write your class’s longest time on the board. REMIND THE STUDENTS THAT DUE TO THE NATURE OF THE CHALLENGE, THEY NEED TO FOLLOW THE AFOREMENTIONED GUIDELINES SO THAT THE MONKEY NEVER JUST COMES CRASHING ONTO THE MAT.